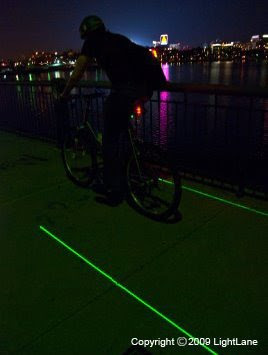 In another post early this year, we told about the concept of a bike lighting system that projects a moving bike lane with you as you ride, using laser beams. The concept was actually created by two industrial designers as an entry to a contest to win a free bicycle. They didn't win the contest or the bike, but they did end up winning the prestigious Gold International Design Excellence Award (IDEA), a design competition co-sponsored by Industrial Designers Society of America (IDSA), BusinessWeek, Target, and Autodesk. You can read more about this award in this press release. The idea generated such interest around the world that they decided to pursue making it an actual product.